will I have issues running a 110/90 18? ..tire fling shouldn't be an issue, what about compression? First, you should not have a 110/90-19 on the stock front wheel. 100/90-19 is the correct size. With the 18 inch wheel, you should go with a 110/80-18. It will fit fine and the fender will look OK. If you don't like the look, you can lower the fender to suit. Why do you recommend the 110/80 -18 vs 110/90-18? On my '81 with the 18" Boomie i used a 100/90-18. Bridgestone Spitfire S11 and BT45. Don't think they are making the S11 any more. The fender has been lowered 1" in this photo. I think you have more tire choices and I think it handles better with the 110/80. I assume you have now the 17 inch rear as well? If so, a 140/80-17 matches well with the front. Steve - I see you have the vented Pro-Link rotors. A lot of unsprung weight there. I'd chuck those and get, say, 900F rotors and calipers. Those calipers and hangers will not work with the thinner and smaller diameter rotors. Nice-looking set-up though. The bt45 options for front were 110/80 or 110/90...my concern was would the smaller 18 have clearance issues with a 110 and if not 80 or 90 and why one vs the other? Both do. The drive has to be matched to the wheel and speedo. The drive gets an input from the wheel and returns an output according to its ratio. The speedo converts the input rpm from the drive to a mph indication. 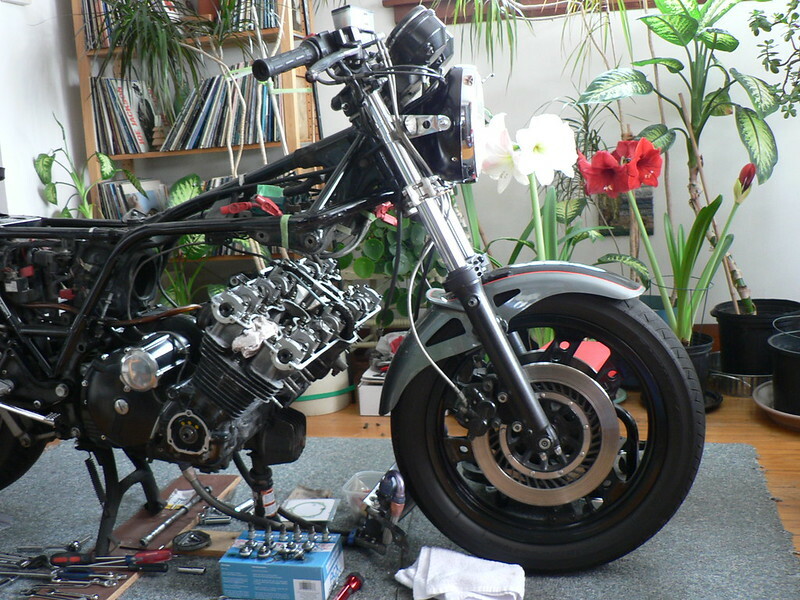 That being said, a speedo drive for a 18" wheel will not necessarily give you the correct rpm for the CBX instrument. If you are lucky, it will. daves79x wrote: Steve - I see you have the vented Pro-Link rotors. A lot of unsprung weight there. I'd chuck those and get, say, 900F rotors and calipers. Those calipers and hangers will not work with the thinner and smaller diameter rotors. Nice-looking set-up though. I think i have everything to do that swap. Finding it is another matter. in that case it'll be simpler if I remove the 750 drive and put back the cbx drive, the speedo won't be exact but it'll put me just under the posted limit. As I generally ride over posted limits it'll save me encounters with the police. In the city they allow 9 over posted and on the highway 15 over before they issue a ticket and as I tend push up to those limits it'll give a margin of error.